A few months ago, I had the opportunity to attend FLOC’s Wednesday night Neighborhood Tutoring Program (NTP) at Jubilee Housing in the Adams Morgan neighborhood. After greeting students and tutors, sharpening boxes of pencils and distributing books and dictionaries, I sat down to observe student/tutor pairs in action. I soon noticed a young professional woman in her 30’s working with a boy, maybe age 12. They were partner-reading a book entitled, The Dark is Rising. I heard the tutor mention that the book was one of her favorites when she was a child. There were many smiles and inside jokes passing back and forth as their reading and conversation progressed. The way the two were reading alternate pages reminded me so much of the way my husband and I read books with my eldest daughter when she was young. Unlike my daughter who was diagnosed with serious learning disabilities at age 5 (extremely slow language processing speed), this young boy was a good reader. What caught and held my attention was that his tutor was actually showing him how to analyze the text and how to reason inferentially as they read together. This boy’s tutor would remind him of a character’s behavior in early chapters and ask him to explain the character’s current behavior and also to predict the character’s future behavior. The FLOC tutor was providing this child with the tremendous benefit of individualized reading and language arts instruction that I can guarantee he was not receiving on a one-on-one basis in his classroom. This young man is benefiting from his tutor’s knowledge, considerable instructional ability and obvious interest in him. 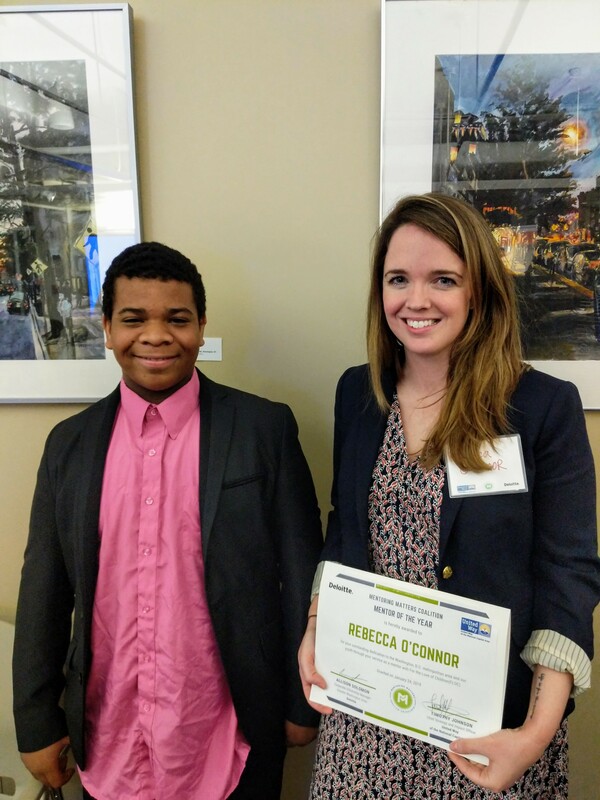 I discovered last night that this tutor’s name is Rebecca, and that she was just awarded the 2019 United Way Mentoring Matters Mentor of the Year Award! At FLOC we are so proud of our students and the progress they make every week—and so very grateful for the commitment of our incredible tutors!